I started working on the design of my daughter's Shabby chic garden nursery with no real idea where I wanted to take it. I had no concept of the color or style until I picked out her baby bedding set first which was Migi Posy. I chose the Migi Posey collection for no other reason than that I liked the colors and flowers. 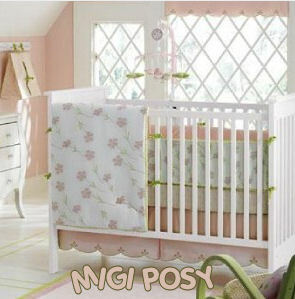 The shades of pink and green as well as the retro look of the baby bedding appealed to me. I decided to decorate according to a color scheme than a baby nursery theme. I really liked the pink and green colors together and I thought that white pulled the room together nicely. The main wall paint color that I used for the project was called Prairie Sage and then I used white to paint the trim. The bottom portion of the nursery walls was already wallpapered with two tone beige stripes and I decided to keep it because it matched the upholstery of the glider rocker. We put in new floors which caused us to need to take down the closet doors. In the process, we decided to leave the doors off and install curtains in their place. The curtain on the window is Target's Simply Shabby Chic Faux Silk Balloon Shade in pink. The curtains that we used in the closet are also from Target. They are from the Simply Shabby Chic Fairy Tale as is the pillow on the chair which worked very nicely with our baby girl's shabby chic nursery decor. The bookshelf and the area rug are also from Target. Her baby bed and chair came from a local baby shop called Brousse's A Child's World. The butterflies hanging in the corner and the big flowers on the wall are also from Brousse's. I used scrapbooking paper to make the stems and leaves for the flowers. I used the same scrapbooking papers to decorate the letters of Marisa's name above her closet. The mirror above the bookshelf came from Hobby Lobby and other accessories come from various stores. I have managed for the majority of her toys to be stored in the closet for the sake of containing the clutter. Green storage baskets organize her smaller toys in the bookshelf and on the bottom shelves of the changing table which is stored inside the closet. Wire racks from Target hold Marisa's bigger toys as does the toy box from Toys R Us. In my opinion, the pictures don't do my baby's shabby chic garden nursery justice. I suspect that I adore this room not only because of its beauty but also because of how it makes me feel while playing with my daughter and lying her down to sleep. Please drop by Unique Baby Gear Ideasto see us again soon because you will find that we update our nursery pictures often and it would be a shame to miss the new DIY projects that our visitors share. Hi, Jill! I love what you did with the nursery and even though I am not planning a shabby chic nursery; I love the MIGI crib set that you chose but I can't find one to buy. Does anyone know where I might find the Posy collection for sale? Love the room, I really like what you did with the wardrobe the most. Great ideas! Join in and write your own page! It's easy to do. How? 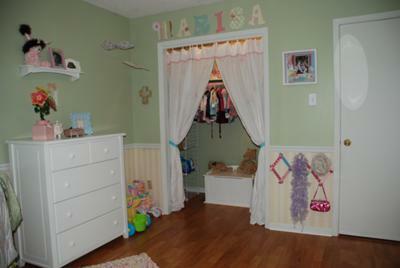 Simply click here to return to SHABBY CHIC and VINTAGE NURSERY PICTURES and IDEAS.